On a stretch of highway just outside the most magical place on earth, six-year-old Moonee and her ragtag band of playmates spend an unforgettable summer at The Magic Castle, a budget motel managed by Bobby. Bobby's stern exterior hides a deep reservoir of kindness and compassion as he watches over the kids' adventures, protecting them from some of the harsher realities of life. 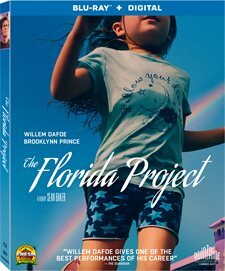 Download The Florida Project in Digital HD from the iTunes store. 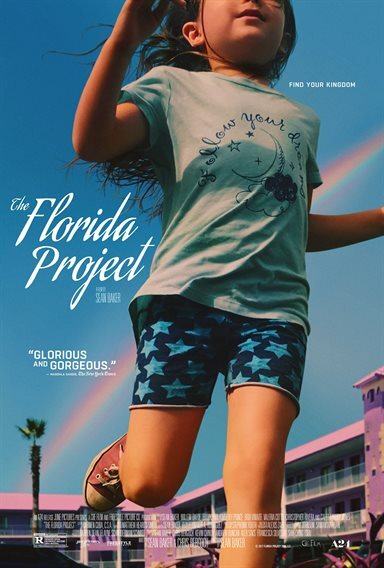 The Florida Project images are © A24. All Rights Reserved. Homelessness in the United States has reached staggering proportions and shattered our normal perception of what a homeless person looks like. So often we automatically think of the bum on the street laying on a cardboard bed, the woman dressed in layers pushing around a shopping cart of old bags or blankets or the person at the street corner begging for food and money. Unfortunately, there is a whole segment of the homeless population no one wants to even consider… the children. Families are staying in welfare motels with children who are going hungry and have little to no supervision. The realities of these situations are dramatized in an independent film by Sean Baker (Tangerine) called The Florida Project. Hailey (Bria Vinaite) is a young, single, unemployed mother living in the purple colored Magic Castle motel. Her six-year-old daughter, Moonee (Brooklynn Kimberly Price; Robo-Dog: Airborne), lives with her in a single room with a bathroom. Once every month, they must "move out" for one night only to come back for 30 more days. Hailey spends most of her time sitting around while Moonee runs around the Orlando "trip", a stretch of highway dotted by cheap motels and souvenir shops. Moonee's friends often join her on these adventures as they beg for change to buy ice cream or accidentally burn down an abandoned apartment complex. Hailey does whatever she can to make rent including selling knock-off perfumes to tourists with Moonee along for the ride, turning tricks while Moonee sits in the bathtub or stealing things from the tricks and selling them to unsuspecting individuals. Moonee, while wise beyond her years, is too young to fully comprehend what is going on. Meanwhile, the motel maintenance guy, Bobby (Willem Dafoe; Spider-Man) is unofficially charged with the task of looking after Moonee and her friends and doing his best to keep Hailey and the other welfare residents in line. The old adage in Hollywood is don't work with kids and animals but Baker amassed a talented group of youngsters who manage to do a good job in their roles. Price is especially a pleasant surprise as she has great inflection and depth for someone so young. Newcomer Vanaite offers an interesting yet vile take on the welfare mother. Dafoe is masterful, once again proving why he is a critically acclaimed actor. The rest of the cast, including a mix of children and unseasoned adults, makes for an interesting mix of talent. The Blu-ray is presented in 1080p high definition video with a 2.38:1 aspect ratio. The Florida landscape is ripe with colors that pop including the purple hues of the motel and the spectrum displayed by the rainbow overhead. The DTS-HD Master Audio 5.1 is clean and sharp with a well-balanced mix of dialogue, background noise, and music. The combo pack offers a Digital HD code and three extras. These include: Outtakes/bloopers that mostly features the kids, cast and crew interviews that run almost an hour long and a twenty-two minute "making of" piece. All seem a little discombobulated but informative nonetheless. My biggest gripe about the movie is the plot. Hailey is a piece of garbage who does nothing to better herself and blames everyone around her. She endangers not only her own life but that of her daughter's as well. She abuses a system that was put in place to help short-term and doesn't teach Moonee anything but lies and stealing. I'm sure the writing was meant to garner sympathy for people in Hailey's position but, for me, it simply angered me to see how Hailey didn't even try and how she basically corrupted her daughter. While it's apparent she loves Moonee, she is too immature to truly parent her. Baker does an excellent job of editing the film and the pace moves along nicely. The script is well done and the subject matter interesting. For many, the movie deserves high praise and I agree with most of it. Unfortunately, I feel it glamorizes the welfare system and gives a legitimacy to the idea of those in the system are victims. While some are, some choose to be victims and bring their children along for the ride. While well executed, it deserves much of that praise but made me angry all the same.